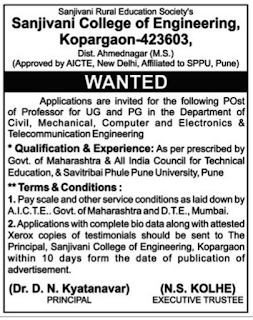 Sanjivani College of Engineering, Kopargaon, Maharashtra has advertised for the recruitment of Teaching Faculty- Pofessor jobs vacancies. Interested and eligible job aspirants are requested to apply with in 10 days from the date of publication. Check out further more details below. 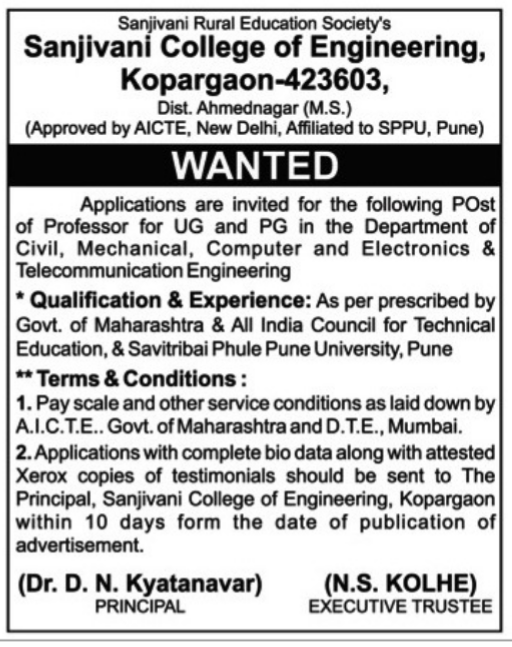 Name of the College: Sanjivani College of Engineering,Kopargaon ,Maharashtra. About College:Sanjivani College of Engineering, Kopargaon is one among the premier technical institutes in Maharashtra state in the un-aided sector. Established in 1983 by the Sanjivani Rural Educational Society under the charismatic leadership of Shri. Shankarrao G. Kolhe, the Institute had its vision for social transformation and , upliftment of rural masses through education, training and research. How to Apply: Application with bio-data along with attested Xerox copies of testimonials should sent to below mentioned address within 10 days from date of advertisement.